The shadowy dealings of a flamboyant Italian businessman, whose alleged proximity to the powers-that-be to fix a gun deal that triggered political convulsions in the late 1980s, are back to haunt the establishment here again. 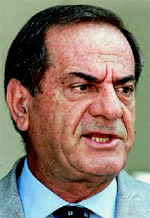 Ottavio Quattrocchi, who was detained in Argentina early this month, could not have surfaced in the news at a worse time for India's ruling coalition led by the Italian-born Sonia Gandhi whose husband Rajiv Gandhi died long before he was given a clean chit in the multi-billion dollar Bofors bribery scandal. As the government seeks his extradition, Quattrocchi has unwittingly provided the opposition with a live wire issue as parliament is in session and Uttar Pradesh, India's most politically consequential state, goes to the polls next month. How could an Italian businessmen, that too an alleged beneficiary of the Bofors deal, get such a vice-like grip on the swings of Indian politics? Quattrocchi did not wield the gun to get his way around the incestuous power set-up in New Delhi. He had other weapons: Sicilian charm (the city where he was born) and cunning spiked with a habit of dropping the names of literally the who's who of India's political and bureaucratic elite. Mr Q, as he was called by the cocktail party crowd that flocked to his pasta and wine parties, was a born mover and shaker long before that expression became a clich'. His business description was rather mundane: Snamprogetti, a Milan-based Italian multinational company involved in engineering and construction projects, which he represented in India. But his real calling card was his closeness to then prime minister Rajiv Gandhi and his wife Sonia. It was the magic key that opened the levers of powers wherever he went, dressed in his savviest Italian suits. In the nearly 16 years that he represented the Italian company in Asia, he proved his wizardry as a networker and managed to garner as many as 60 projects worth more than $600 million. Life was one big party for Quattrocchi, who arrived in India in the mid-1960s, till a seemingly innocent report on Swedish Radio in 1987 broke the news of hefty bribes being paid to top Indian politicians and officials to secure the Bofors gun deal and rocked the political establishment. The stench of the scandal wafted into the elections in 1989 when opposition parties boomed with slogans of "Rajiv Gandhi chor hai." The Congress party lost. And Mr Q, the hustler with a strong survival instinct, knew instinctively that his joyride was over. Mysteriously, despite being in India at that time, his passport was not impounded and he managed to flee the country. Since then he has been a shadowy fugitive, on the run from Indian intelligence agencies and an Interpol red corner notice. In 1999, the Central Bureau of Investigation (CBI) named him in a chargesheet as the conduit for the Bofors bribes. The CBI said AE Services, a firm owned by Quattrocchi and his wife Maria, had received illegal payments to the tune of $7 million from the Swedish arms manufacturer. Four years later, Interpol revealed two bank accounts held by Quattrocchi and his wife Maria with the BSI AG bank, London, that contained 3 million euros and $1 million - huge savings for a mid-level Italian business executive. The accounts were subsequently frozen. Last year, this money was withdrawn within days of a London court deciding that there was no legally solid case against him after a request from B. Dutta, the additional solicitor general from India. But the suspicion that Quattrocchi was the one who got the gun deal rolling and became a conduit for the transfer of the Bofors paybacks simply refuses to go away, casting his shadow over Indian politics that seems to be getting longer by the day.